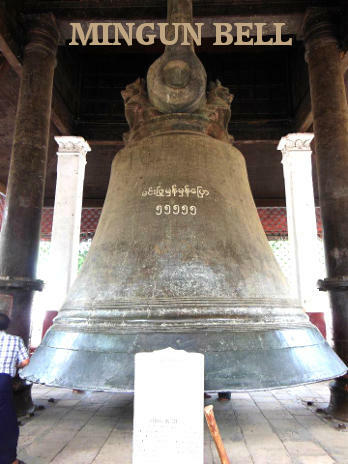 The weight of the Mingun Bell, still one of the largest and heaviest ringing bells in the World, is inscribed in the above riddle. 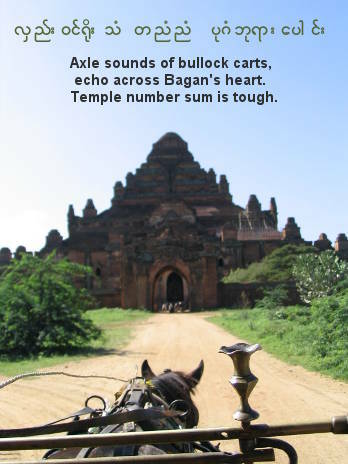 At the height of Bagan civilization and before Mongul invasion, there were 4,446 temples and pagodas in Bagan. Considering that AD 2014 corresponds to the year 1375 in Burmese calendar, the year 1221 in Myanmar Calendar can be estimated by subtracting 154 years as AD 1860. But, a year in Burmese calendar is less than 365 days, so it is not exact. The actual day that Mandalay was founded by King Mindon Min was on 13 February 1857. 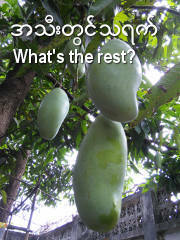 Mangoes are certainly a favorite fruit among Burmese. Mango season starts from around May and available during the three months of rainy season. The most popular types are Mun3-da1-lay3 yin2-kweare3, Ma1 Chit Su1, and Sain2-ta1-lone3. The green mangoes before they ripe, especially Ma1 Chit Su1 variety, are coated with liquorice powder, chilli powder, and salt before they are eaten either as snacks or as a side-dish with rice. Mango pickle (Indian Chutney style) in oil and spices are also available all year around. This proverb shows that Burmese people also enjoy having pickled tea leaves while engaging in conversation with guests. In the old days in upper Burma, the ingredients of the pickled tea leave salad လက်ဖက်သုပ် were served in separate small bowls instead of mixed salad like in present day Yangon. Some Burmese do not take Beef, but pork with a layer of fat is cooked until the rind part is tender. 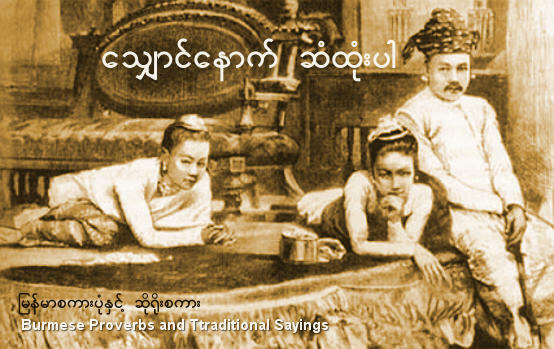 Proverbs, maxims and sayings are often used by the Burmese people to illustrate the point, to make eloquent speeches, and to engage in lively conversations. Those are the true essence of Myanmar heritage passed down from a generation to the next. The traditional sayings are not only words of wisdom, they also insinuate, poke fun, and commemorate the cultural history of forefathers generations ago. For researchers, scholars, as well as Burmese descendants who grew up outside Myanmar, they will give some insight into Burmese way of life, belief system, and traditions. While the selection of proverbs and sayings in Burmese script are original, English translations are my versions which preserve the original meaning and usage of words as much as possible. The beauty of Burmese rhymes and rhythms are best appreciated in the original Burmese script. Reference: မြန်မာစကားပုံနှင့် ဆိုရိုးစကား by ပညာကျော်; Pyinya Kyaw (Pyin2 Nya2 Kjau2); Unity Publishing House, Yangon, June 2009. ကလေးရှက်တော့ငို၊ လူကြီးရှက်တော့ရယ် | kha1-lay3 shet dau1 ngo2, lu2-ji3 shat dau1 yi1 - When embarrassed, children tend to cry, and adults tend to laugh. - Adults with good dispositions tend to laugh with others in embarrassing situations. ကုသိုလ်လည်းရ ဝမ်းလည်းဝ | ku1-tho2 leare3 yah1 woon3 leare3 wah1 - Make merit and fill stomach at the same time. - This describes the joy of making a decent living where good deeds can be made, such as saving someone's life as a doctor, or passing on the knowledge to the students as a teacher. ကံထမ်းလာတာမမြင်ရ၊ လှံထမ်းလာတာသာမြင်ရ | kun2 htun3 la2 ta2 ma1 myin2 yah1, hlun2 htun3 la2 ta2 tha2 myin2 yah1 - A spear carried on the shoulder can be seen; "fate" carried on the shoulder is unseen. - A phrase used by some who over-emphasize "fate" carried from the past as opposed to making destinies in the present moment. ကံယုံ၍ ဆူးပုံမနင်းရာ | kun2 yone2 yway1 hsu3-pone2 ma1-nin3 ya2 - Don't jump into a pit of thorns out of blind faith. - It will be 'inappropriate' to carry actions out based on illogical reasoning. ကမ္ဘာမီးလောင် သားကောင်ချနင်း | ka1-ba2 mi3 loun2, tha3-koun2 cha1 nin3 - When the world is on fire, some will step on their own children (to insulate the heat). - Despicable persons exist in this world who will sacrifice their own children for survival. ကိုယ်ထင် ခုတင်ရွှေနန်း | ko2 htin2 ga1-din2 shway2 nun3 - Deluded person thinks his bed is the golden palace - Some people tend to get lost in the fantasy world with unrealistic expectations. ကိုယ်နှင့်နှိုင်း မရိုင်း | ko2 hnin1 hnine3 ma1 yine3 - Don't compare yourself with others and assume others are rude. - A reprimand to a rude person who thinks there's nothing wrong with wrongdoings and bad behaviors. ကြာကြာဝါးမည့်သွား အရိုးကြည့်ရှောင် | kja2 kja2 wa3 myi1 thwa3, a-yo3 kji1 shoun2 - Teeth that must grind into old age must avoid chewing bones - An advice to look into long-term. ကြာကြာဝါးမှ ခါးမှန်းသိ | kja2 kja2 wa3 hma1 kha3 hmun3 thi1 - Bitter taste is apparent only after chewing for some time. - The true character of a wicked person is apparent only after knowing the person well. ကြီးသူကို ရိုသေ၊ ရွယ်တူကို လေးစား၊ ငယ်သူကို သနား | kji3-thu2 go2 yo2-thay2, yweare2-tu2 go2 lay3-za3, ngeare2 thu2 go2 tha1-na3 - Revere the elders, respect the peers, be kind to the young - No further explanation is needed for this Burmese tradition. ကျွဲပါးစောင်းတီး | Kjweare3 pa3 soun3 ti3 - Like playing a harp to a buffalo - Uncultured person will not appreciate finer things in life. ကျွန်းကိုင်းမှီ ကိုင်းကျွန်းမှီ | Kjoon3 kine3 hmi2, kine3 kjoon3 hmi2 - Island depends on reeds, reeds depends on island - Inter-dependent relationship is compared to the formation of islands in the river and delta from the dense network of reeds. ခလုတ်ထိမှ အမိတ | Kha1-loat hti1 hma1 a-mi1 tah1 - Stumble and fall, only then "mother, mother" called. - Refers to certain young people who ignore the guidance of those who nurtured them, but call for help when in trouble. ခါချဉ်ကောင် မာန်ကြီးလို့ တောင်ကြီးဖြိုမည့်ကြံ ခါးကမသန် | Kha2-chin2 koun2 mun2 kji3 lo1 toun2 ji3 pfyo2 meare2 kjun2, kha3 gah1 ma1 thun2 - An arrogant red ant attempts to bring down the mountain, but the waist is weak - There is a limit to our capabilities, and we must have the wisdom not to aim for something beyond our reach. ခေါင်းတစ်ရာသားစား | Goun3 ta1 ya2 tha3 sa3 - To eat a dish of hundred heads. - This saying is from the story of an old man giving instructions to his sons in riddles before he died. 'A hundred heads' refers to small anchovies which are inexpensive. By living modestly, and not spending extravagantly on food, one saves money. ချက်ဆို နားခွက်က မီးတောက် | 'Chet' hso2 na1-khwet gah1 mi3 tout - A squeeze with a click, a spark is made in the firearm. - Before the invention of rifles and bullets, gunpowders packed in the barrel were used to fire musket type of guns. Just a squeeze of a trigger makes a 'chet' (click) sound with a spark from the flintlock mechanism. This example is compared to a bright person who understands the whole situation with just a slight hint. ချစ်စကိုရှည်စေ၊ မုန်းစကိုတိုစေ | Chit sa1 go2 shay2 zay2, mone3 sa1 go2 toe2 zay2 - Let love live long, let hate short live - An advice not dwell on hatred, but to live in harmony. ခြောက်တိုင်းလည်း မကြောက်နှင့်၊ မြှောက်တိုင်းလည်းမမြာက်နှင့် | Chout tine3 leare3 ma1 kjout hnin1, hmyout tine3 leare3 ma1 myout hnin1 - Don't be afraid of every intimidations. Neither should you fall for every flatters - An advice on ways of the world. ချွေတာစုဆောင်း သူဌေးလောင်း | Chway2-ta2 su1-hsoun3 tha1-htay3 loun3 - Save and live modestly to become a millionaire in the future - self-explanatory. ငါးကြင်းဆီနှင့် ငါးကြင်းကြော် | Nga1-jin3 hsi2 hnin1 nga1-jin3 kjau2 - To fry the Hamilton's Carp (fish) with its own oil - The same idea as making use of money by lending to make more money. Showing ingenuity in business undertaking, or in warfare where the strength of the enemy is used against the enemy. ငါးခုံးမတစ်ကောင်ကြောင့် တစ်လှေလုံးပုပ် | Nga1-khone3-ma1 ta1 goun2 joun1 ta1 hlay2 lone3 poat - One rotten Barbus (fish) fills the whole boat with foul smell - Reputation of a family, an organization, or a nation can be ruined by the behavior or wrongdoings of a person or a small group of people. ငါးစိမ်းမြင် ငါးကင်ပစ် | Nga1-zain3 myin2, nga1-kin2 pyit - Fried fish is dropped when a fresh one is seen - This phrase can be used to insinuate a married man having an extramarital affairs. ငှက်မသိက ဆက်ရက်ကို ချိုးထင်၊ အချက်မသိက သမက်ကို သူခိုးထင် | Hngat ma1 thi1 gah1 za1-yet go2 jo3 htin2, a-chet ma1 thi1 gah1 tha1-mat go2 tha1-kho3 htin2 - A person ignorant about birds thinks a Myna (Tropical Asian Starling) is a dove. Likewise, future son-in-law who has been seeing the daughter in secret is mistaken for a thief. - Obviously, father does not know everything! ဆရာမပြ နည်းမကျ | Hsa1-ya2 ma1 pya1, ni3 ma1 kja1 - No teacher, wrong method - Even self-study materials must be written by someone. ဆူးပေါ်ဖက်ကျ ဖက်ပေါက်၊ ဖက်ပေါ်ဆူးကျ ဖက်ပေါက် | Hsu3 pau2 pfat kja1, pfat pout. Pfat pau2 hsu3 kja1 pfat pout - When the thorn falls on the leaf (used for wrapping food), leaf is punctured. When the leaf falls on the thorn, the leaf is still punctured. - Reminder of the vulnerability of the weak when faced with the stronger adversary in both defensive and offensive positions. ဆင်ပိန် ကျွဲလောက် | Hsin2 pain2 kjweare3 lout - A skinny elephant still is the size of a buffalo - When rich people get poorer, they are still rich by comparison. တော်သလင်းနေ ပုစွန်သေ | tau2-tha1-lin3 nay2 ba1-zoon2 thay2 - Even the prawns die under the sun during the month of "tau2-tha1-lin3". - The month near the end of rainy season (around September) can be too hot. A good conversation maker during that month to describe the sweltering heat. တောမီးလောင် တောကြောင်လက်ခမောင်းခတ် | tau3 mi3 loun2 tau3-kjoun2 let-kha1-moun3 khut - Jubilation of the wild cat when the forest is on fire - The term let-kha1-moun3 khut is the act of whacking one's folded arm with the palm to show challenge in Myanmar traditional boxing ring. In times of anarchy, lootings, robberies, and rapes take place. တစ်ခါသေဖူး ပျဉ်ဖိုးနားလည် | ta1-kha2 thay2 pfu3, pyin2 pfo3 na3 leare2 - Once there is death, one understands the cost of the coffin. - We learn from past experience. တစ်ချက်ခုတ် နှစ်ချက်ပြတ် | ta1 chat khoat, hna1 chet pyut - One slash cuts at two places. - stressed the importance of efficiency. For example, several things are accomplished in one trip of journey. တစ်ဆိတ် တစ်အိတ်လုပ် | ta1 zate, ta1 ate loat - To make a pinch ( a bite or small amount) a bag. - A phrase used to complain that someone is exaggerating. တစ်ရွာမပြောင်း သူကောင်းမဖြစ် | ta1 ywa2 ma1 pyoun3, thu2 koun3 ma1 pfyit - Move out of the village, make it big. - Small hometown provides limited opportunity. Make a fresh start by moving out. တစ်လုတ်စားဖူး သူ့ကျေးဇူး | Ta1 loat sa3 pfu3 thu1 kjay3 zu3 - A bite of food, gratitude - We should not forget and be thankful to someone even for a spoonful of food when we were in destitute. တိတ်တိတ်နေ ထောင်တန် | Tate tate nay2, htoun2 tan2 - A silent is worth a thousand words - Silence is golden. An advice not to waste time engaging in mindless talks. တန်ဆေး လွန်ဘေး | Tan2 hsay3, loon2 bay3 - Medication if moderate, harmful if excessive. - Anything excessive is harmful. For example, a glass of wine is good for the heart, but excessive amount of alcohol can be harmful. တိမ်မယောင်နှင့်နက်၊ လွယ်မယောင်နှင့်ခက် | Tain2 ma1 youn2 hnin1 net, lweare2 ma1 youn2 hnin1 khet - Shallow in appearance but deep; easy in appearance but hard. - Only after trying out, one realizes that certain task is not easy as one thought. ထမင်းအသက် ခုနှစ်ရက်၊ ရေအသက် တစ်မနက် | Hta1-min3 a-thet khoon2-na1 yet, yay2 a-thet ta1 ma1-net - Rice gives subsistence for seven days; water gives life just a day. - It is possible to stay alive without eating (rice) for seven days, but a day without water can be fatal. ထန်းသီးကြွေခိုက် ကျီးနင်းခိုက် | Htun3-thi3 kjway2 khite, kji3 nin3 khite - Fruit of the palm tree drops just when the crow steps on it. - Some unrelated events occurring simultaneously is explained as co-incidence. ဒီယုန်မြင်လို့ ဒီချုံထွင် | De2 yone2 myin2 lo1 de2 chone2 htwin2 - This bush is created just because this rabbit is seen - The word htwin2 can either mean "to create", or "to clear up". This saying can also be translated as "This bush is cleared up." But, the main idea is the same: with the intend of catching the rabbit. This saying describes the deception made to gain something, and somewhat implies using dishonest means. နီးလျက်နှင့်ဝေး | Ni3 hlyat hnin1 way3 - Near and yet far - Due to circumstances, unable to get in touch, communicate, or to visit someone although living in the same town or vicinity. နွားကွဲ ကျားကိုက် | Nwa3 kweare3 kja3 kite - Cows that do not stay as a herd become victims of tiger - A divided nation or a broken family is vulnerable to attack by outsiders. နွားရှေ့ထွန်ကျူး | Nwa3 shay1 htoon2 kju3 - To put the harrow in front of the bullock - Even in the present day, bullocks are still used to pull the harrow for farming. It will be inappropriate to put the harrow in front of the bullock. In the same way, youngsters should follow the instructions from the elders, not the other way around. ပညာလို အိုသည်မရှိ | Pyin2-nya2 lo2 o2 thi2 ma1 shi1 - Never say too old to gain new knowledge - learning is a life long process. ပညာ သမာ အာဘာ နတ္တိ | Pyin2-nya2 tha1-ma2 ah2-ba2 nate-hti1 - There is no light as bright as knowledge - tha1-ma2 means "similar to". nate-hti means "none" or "empty". ah2-ba2 is the color as a result of refraction of the white light. ပါးစပ်က ဘုရားဘုရား လက်က ကားရားကားရား | Ba1-zut gah1 pfa1-ya3 pfa1-ya3, let gah1 ka3-ya3 ka3-ya3 - Mouth says God's prayers, as the hand does inappropriate things. - Refers to hypocrites who pretend to be religious and respectable persons. ပိယေဟိ ဝိပ္ပယောဂေါ ဒုက္ခော | Pi1-yay2-hi1 wate-pa1-yau3-gau3 doat-khau3 - To be separated from the loved ones is suffering, - wate-pa1-yau3-gau3 (to be separated from) pi1-yay2-hi1 (loved ones) - Pali origin from Buddhism. ပေါက်တဲ့နဖူး မထူး | Pout teare1 na1-pfu2 ma1 htu3 - Broken forehead does not matter anymore - To accept the situation just like the injury and the scar on the forehead that cannot be mended. It also encourages to go ahead and take the risk as the damage is already done. ပစ်ရမှာလည်း အဆီနှင့်ရဲရဲ၊ စားရမှာလည်းသဲနှင့်ရှပ်ရှပ် | Pyit yah1 hma2 leare3 a-hsi2 hnin1 yeare3 yeare3, sa3 yah1 hma2 leare3 theare3 hnin1 shut shut - A chunk of roasted meat on the floor - too meaty to throw, too much sand on it to eat. - Dilemma as to what to do when something or someone with value or attachment is no longer suitable for the intended purpose. ပျားကိုပုံပြု၊ ချကိုတု၊ ရမှုဥစ္စာရတနာ | Pya3 go2 pone2 pyu1, cha1 go2 tu1, yah1 hmu1 oat-sa2 ya1-da1-na2 - Learn from the bees, imitate the termite, jewel indeed to be gained - Teamwork and industrious nature of the bees and the termites are to be imitated in order to be prosperous. ပျော်ပျော်နေ သေခဲ | Pyau2 pyau2 nay2, thay2 kheare3 - Die hard lives happily - Happiness is the ingredient to a long life. ပျော်ရာမှာ မနေရ၊ တော်ရာမှာနေရ | Pyau2 ya2 hma2 ma1 nay2 yah1, tau2 ya2 hma2 nay2 yah1 - Choose a suitable place over fun-to-live place. - An advice for health, safety, and to accumulate wealth. ပျောက်သောသူရှာလျှင်တွေ့၊ သေသောသူကြာလျှင်မေ့ | Pyout thau3 thu2 sha2 hlyin2 tway1, thay2 thau3 thu2 kja2 hlyin2 may1 - Lost person is found when searched; dead person is forgotten with time. - A saying with a rhyme to give hope for reunion with the lost person, and at the same time gives comforting words over death of someone dear to the bereaved family. ပြုလျှင်အသစ် ဖြစ်လျှင်အဟောင်း | Pyu1 hlyin2 a-thit, pfyit hlyin2 a-houn3 - Actions are new, consequences are old. - The immutable law of "Karma" where new actions in the present will make future consequences, whereas consequences of the old actions bear fruit in the present moment. ပြင်လွန်း ဖင်ချွန်း | Pyin2 loon3 pfin2 choon3 - Too much refinements spoil the bottom of the pot. - During turning process in making a clay pot, too much refinements disfigure the bottom part of the pot. (choon3 = elongated with sharp end instead of flat bottom.) Too much perfections sometimes end up with undesirable results. ပွဲပြီး မီးသေ | Pweare3 pyi3 mi3 thay2 - Fire went out as soon as the show was over. - The initial enthusiasm dies down over a fad. ဖောင်စီးရင်း ရေငတ် | Pfoun2 si3 yin3 yay2 ngut - On the raft, and yet there is thirst. - Inability to make advantage of opportunities all around. ဖြစ်သမျှအကြောင်း အကောင်းချည်းပဲ | Pfyit tha1 hmya1 a-kjoun3 a-koun3 chi3 beare3 - Whatever happens is for the best. - Whatever will be, will be. Positive outlook on life without worrying too much. ဖွဲကိုထောင်းလို့ ဆန်ကောင်းမရ | Pfweare2 go2 htaun3 lo1 hsan2 koun3 ma1 yah1 - You cannot get white rice by pounding on the husk. - A person lacking virtue (compared to the husk) cannot become a respectable person in the community. ဖွတ်မရ ဓါးမ ဆုံး | Pfoot ma1 yah1, da1-mah1 sone3 - On top of not getting the lizard, chopper is lost. - A chopper (da1-mah1) was dropped in the river and lost during the hunt for the monitor lizard (pfoot). On top of failure to achieve the objective, there was further misfortune. ဘုရားပြီး ငြမ်းဖျက် | Pfa1 ya3 pyi3, nyan3 pfyet - When the Pagoda is completed, scaffolds are removed. - Scaffolds are used to build Pagodas. But, once the construction of pagoda is completed, scaffolds are removed. This describes how people who helped someone to succeed are forgotten when that person becomes famous. ဘုရားမှတ်လို့ ကိုးကွယ်ပါ၊ ဖွတ်ထွက်မှ တောင်ပို့မှန်းသိ | Pfa1 ya3 hmat lo1 ko3-kweare2 ba2, pfoot htwet hma1 toun2-bo1 hmun3 thi1 - A mound was mistaken to be a pagoda and worshipped, until the lizard came out. - A despicable person was mistaken for a virtuous person until his immoral traits came to surface. ဘူးဆိုလျှင် ဖရုံမသီး | Bu3 hso2 hlyin2 pfa1-yone2 ma1 thi3 - A marrow plant won't bear pumpkin fruit. - This proverb makes use of the double meaning of the word Bu3, which is the negative ending word as well as a marrow or a gourd. It's like saying: "When I say no, it's no", and it could also mean: "I already said marrow, I will not change my mind and say pumpkin." ဘုန်းကြီး စာချ | Pfone3 kji3 sa2 cha1 - To lead the monk in recitation. - The word sa2 cha1 is to lead the recitation done by the monks or teachers where laypersons or students repeat after the leader. This proverb shows how inappropriate it would be when an arrogant person instructs a learned person what to do. ဘယ်သူမပြု မိမိမှု | Beare2 thu2 ma1 pyu1, mi1 mi1 hmu1 - We are heir of our own deeds - The benefactors of the consequences we face are none other then our own selves. There is no one to blame but ourselves. မကောင်းလည်းခံ၊ ကောင်းလည်းစံ | Ma1 koun3 leare3 khan2, koun3 leare3 sun2 - No choice but to endure if bad and enjoy if good. - This saying describes the marriage in which one must either endure or enjoy depending on whether the spouse is good or bad. In those days, divorces were unheard of. မကောင်းသူကို ပယ် ကောင်းသူကို ကယ် | Ma1 koun3 thu2 go2 peare2, koun3 thu2 go2 keare2 - Reject the bad, save the good. - One explanation is that celestial beings and great kings tend to protect the good people and reject the immoral people. It also means we should stay away from the immoral people, and save the good when opportunity arises. မစားရသည့်အမဲ သဲနှင့်ပက် | Ma1 sa3 yah1 thi1 a-meare3, theare3 hnin1 pet - Splash with sand to beef steak that one cannot have. - The nature of the envious people who can't bear to see other people enjoying life. မဆွတ်ခင်က ညွတ်ချင် | Ma1 hsoot khin2 gah1 nyoot chin2 - The tree lowers its branch before the fruit is plucked. - Offering is made from the willing party before being proposed. မပြေ့သည့်အိုး ဘောင်ဘင်ခတ် | Ma1 pyay1 dthi1 o3, boun2-bin2-khut - Pot not filled to the rim tend to bombard. - Half-filled pots bombard more. မမြင်ဖူး မူးမြစ်ထင် | Ma1 myin2 pfu3, Mu3 myit htin2 - A naive person thinks Mu stream is a river. - Someone who has never seen a river as wide and long as Ayarwaddy River thinks that a small stream called Mu is a river. One danger and the pitfall for the uninformed person is that one tends to be contented with oneself, and unprepared for much stronger adversary in comparison. မမှားသော ရှေ့နေ၊ မသေသော ဆေးသမား | Ma1 hma3 dthau3 shay1-nay2, ma1 thay2 dthau3 hsay3-tha1-ma3 - A lawyer who wins all cases, or a physician who saves all patients - is unheard of. - Despite all the knowledge and experience, we all have our share of human failings. မရှိတာထက် မသိတာ ခက် | Ma1 shi1 ta2 htet, ma1 thi1 ta2 khet - Not knowing is worse than not having. - In life, not having wisdom and knowledge is worse than not having material things. မရှိတောင့်တ ရှိကြောင့်ကြ | Ma1 shi1 toun1-tah1, shi1 kjoun1-kja1 - Yearn for what one does not have, worry over what one has. - Restless human nature where we yearn (toun1-tah1) for things that we don't have. Once we have in possession of what we had yearned for, fear and worry (kjoun1-kja1) of losing replaces the yearning. မလုပ် မရှုပ် မပြုတ် | Ma1 loat, ma1 shoat, ma1 pyoat - Status quo to keep things uncomplicated and to stay employed. - Unfortunately, that phrase refers to civil servants who don't take initiatives, especially during the socialist era. In comparison, some private companies with the US and Japanese corporate culture practice the bottom-up approach, rather than top-down style of management where employee participations and opinions are valued in policy making. မသိလျှင်မေး မစင်လျှင်ဆေး | Ma1 thi1 hlyin2 may3, ma1 sin2 hlyin2 hsay3 - Ask if unknown, clean if dirty. - Common sense approach. Don't just sit there but ask around if there is doubt or question. It should come as naturally as cleaning one's hand if dirty. မသိသူကျော်သွား၊ သိသူဖော်စား | Ma1 thi1 thu2 kjau2 thwa3, thi1 thu2 pfau2 sa3 - Ignorant person walks over the pot of gold. The informed person digs it up. - It stresses the value of knowledge and wisdom. မအိပ်မနေ အသက်ရှည် | Ma1 ate ma1 nay2 a-thet shay2 - Sleep less, and live long. - Based on the fable about not-so-bright person who would someday be king. The young man had learning disabilities, so the monk taught him just three things for him to remember, and this was one of them. According to the story, he stayed awake at night, and survived the attack on him. The other two things he learned are မေးဖန်များ စကားရ - ask to gain knowledge, and သွားဖန်များ ခရီးရောက် - with perseverance, the goal is reached. မီးခဲပြာဖုံး | Mi3 kheare3 pya2 pfone3 - Red hot charcoal covered with ash. - Due to circumstances, resourceful person is unable to demonstrate his capabilities. မီးစာကုန်ဆီခန်း | Mi3-za2 kone2, hsi2 khan3 - A lamp runs out of wick and oil. - As a person reaches the retirement age and enters the sunset of his life, wealth, power and title are gone, and physical strength deteriorated just as the lamp has run out of the wick and oil to continue burning. မီးလောင်ရာ လေပင့် | Mi3 loun2 ya2 lay2 pin1 - Wind blows where there is fire. - The fire burning on the house gets stronger with more destructive power when the wind blows around it. This is a metaphor to troubled times made more problematic by outside interference. မုသားမပါ လင်္ကာမချော | Mu1-tha3 ma1 pa2, lin2-ga2 ma1 chau3 - Poems will be too bland without fabrications. - This refers to the need to be creative in speaking to be eloquent and make lively conversations. မိုးခါး ရေသောက် | Mo3 kha3 yay2 thout - To drink the bitter rain water. - Once upon a time, rain with bitter taste befell on a village. When the villagers got drunk over the bitter rain water, they became crazy. One particular man refrained from drinking the bitter rain water, and he was the only sane person left in the village. Unfortunately, he was the odd one out, and everyone said he was "abnormal" and "crazy" for not drinking what everyone drunk. In the end, the man relented, drunk the bitter rain, and became an insane like everyone else. Similar to "When in Rome, do what Romans do." မိုးရွာတုန်း ရေခံ | Mo3 ywa2 dome3 yay2 khan2 - Collect rain water while it rains. - An advice to take full advantage of the situation when the opportunity arises. မိုးလွန်မှ ထွန်ချ | Mo3 loon2 hma1 htoon2 cha1 - To take the harrow out only after the rainy season - It's like making the effort a little too late. မင်းမှာသစ္စာ၊ လူမှာကတိ | Min3 hma2 thit-sa2, lu2 hma2 ga1-di1 - Loyalty for kings, promise for man. - Just like kings expect loyalty, men are expected to keep their promise. မန္တလေး စကား၊ ရန်ကုန် အကြွား၊ မော်လမြိုင် အစား | Mun3-da1-lay3 za1-ga3, Yan2-gome2 a-kjwa3, Mau2-la1-myine2 a-sa3 - People in Mandalay are known for eloquence, Yangon for bragging, and Mawlamyine for culinary skills. - Self-explanatory. မျက်ကန်း တစ္ဆေမကြောက် | Myet-kun3 ta1-hsay2 ma1 kjout - A blind is not afraid of the ghost. - A reckless person is compared to visually-impaired person who is blind to the danger ahead of him. မွေးနေ့ သောကြာ၊ တနင်္လာ၊ ကေသာဆံဖြတ်၊ မပြုအပ် | Mway3-nay1 Thout-kja2, Ta1-nin3-la2, kay2-tha2 hsun2-pfyat ma1 pyu1 ut. - Avoid hair-cut on birthday, Monday, and Friday (သောကြာ၊ | Thout-kja2.) - The reasoning behind this superstition is unknown. မွေမသေ တုတ်မကျိုး | Mway2 ma1-thay2 doat ma1-kjo3. - Let the snake live, and keep the stick unbroken. - Negotiations and compromises must be made in conflicts for win-win situations. This proverb shows the example of encounter with a snake where snake was let go to safety, and the man kept his sick intact. ယိုသူမရှက် မြင်သူရှက် | Yo2 thu2 ma1 shet, myin2 thu2 shet - Defecator is not shy, the seer is embarrassed. - A person who behaves indecently in public is not shy, but the onlookers are embarrassed. ယုန်ထောင် ကြောင်မိ | Yone2 htoun2 kjoun3 mi1 - A trap for rabbit caught a cat. - Planned for something, but the result was something else. ရေဘူးနှင့် ဖိနပ်မပါ နွေခါမှသိ၊ ဒါနနှင့်သီလမပါ သေခါမှသိ | Yay2-bu3 hnin1 pfa1-nut ma1 pa2 nway2 kha2 hma1 thi1, da2-na1 hnin1 thi2-la1 ma1 pa2 thay2 kha2 hma1 thi1 - Lack of charity and moral principles are regretted at death, just like forgetting a water bottle and slippers in the summer will end up sad. - A Buddhist's line of thought where charity and precepts are considered important for the next life after death. ရေးတော့အမှန် ဖတ်တော့အသံ | Yay3 tau1 a-hmun2, pfut tau1 a-thun2 - When spelled, the word is correct and fit; when read, it's just phonetic. 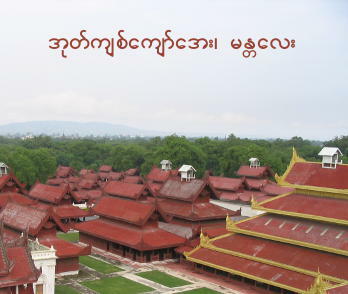 - Burmese words are sometimes read in different phonetic sounds than they are spelled. ရောင့်ရဲတင်းတိမ် လူ့စည်းစိမ် | Youn1-yeare3 tin3-tain2 lu1 si3-zain2 - Contentment is luxury of life. - The person who needs the least is happier than the person who has the most. 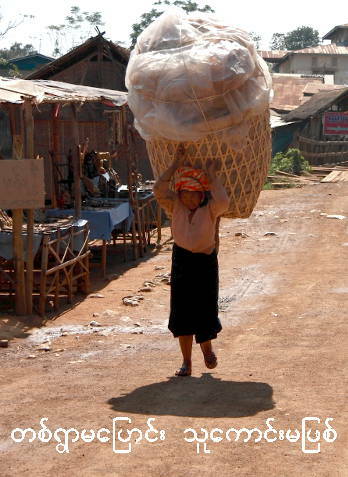 လူပျင်းလုံ့လ တစ်ခဏ | Lu2 pyin3 lone1-la1 ta1-kha1-na1 - Slothful lacks perseverance. - A lazy person's diligence is short-lived. လူမစွမ်း နတ်မ | Lu2 ma1-soon3, nut mah1 - Helping hands from Angels to a man in despair - Although beyond one's abilities, there is success (or get out of trouble) due to helping hands. လူမိုက်နှင့်ငွေ အတူမနေ | Lu2-mite hnin1 ngway2 a-tu2 ma1 nay2 - Unwise person and money do not stay together. - A fool and his money soon parted. လိုလျှင်ကြံဆ နည်းလမ်းရ | Lo2 hlyin2 kjan2 hsah1, ni3 lun3 yah1 - Devise a plan if necessary, a method will be found. - When there is a will, there is a way. လင့်နှင့်မယား လျှာနှင့်သွား | Lin2 hnin1 ma1-ya3, sha2 hnin1 thwa3 - Husband and wife are indeed, like tongue and teeth. - This refers to occasional arguments between husband and wife. လှေနံ ဓားထစ် | Hlay2 nun2, dah3 htit - To mark the side of the boat where the chopper was dropped. - Thinking that by marking the exact position on the side of the boat where the chopper was accidentally dropped, it can be recovered from the river later. Illogical reasoning without proper investigations will end up in vain. လှေပြေးတုန်း တက်ကျိုး | Hlay2 pyay3 dome3 tet kjo3 - Oar broke while the boat was running fast. - Just when something gets going, the most vital element stops working, and everything comes to a halt. လှိုင်းကြီး လှေအောက် | Hline3 kji3, hlay2 out - Big wave is still under the boat. - Social status and authority of a person is compared to the boat above the waves. ဝမရှိဘဲ ဝိလုပ် | Wah1 ma1 shi1 beare3 wi1 loat - To write a "Wikipedia" without knowing a "w" - An arrogant person who has nothing and knows nothing is still acting like he knows everything and has everything. ဝါဆို ဝါခေါင် ရေဖောင်ဖောင် | Wa2-hso2 Wa2-khoun2 yay2 pfoun2 pfoun2 - June and July rivers swell - water, water everywhere - In the two months of rainy season "Wa2-hso2", and "Wa2-koun2" (around mid June, to mid July), there are heavy rains accompanied by frequent flood. သတိမမူ ဂူမမြင်၊ သတိမူက မြူကိုမြင် | Tha1-di1 ma1 mu2 gu2 ma1 myin2, tha1-di1 mu2 gah1 myu2 go2 myin2 - Heedless doesn't see a big cave, vigilant sees even the fine mist. - Mindfulness is needed to recognize the opportunities around us. သားရွှေအိုးထမ်း | Tha3 shway2 o3 htun3 - A wish to see the son carrying back home a pot of gold. - Once a upon a time, a filial son who was looking after the blind parents was bitten by a snake and died. A Genie Spirit (Nat) felt sorry for the bereaved old couple, and granted them a wish. What do you wish? Do you wish your son to come back to life? Do you wish to regain your eyesights, or do you want a pot of gold? The couple gave the winning answer: We wish to see our son coming back home carrying a pot of gold. သူခိုးပြေးမှ ထိုးကွင်းထ | Tha1-kho3 pyay3 hma1 hto3-kwin3 hta1 - To show tatoo and brawn, only when the thief is gone. - Muscle is flexed and tatoo on the thighs are displayed (to fight) only when the danger is gone. သဲထဲရေသွန် | Theare3 hteare3 yay2 thoon2 - To pour water on the sand. - Wasted efforts are compared to pouring water on the sand. သစ်သီးဝလံ ပန်းနှင့်မန် | Thit-thi3 wa1-lun2, pan3 hnin1 mun2 - Fruits and flowers, make them clear. - In Burmese language, fruits from trees with stems such as mangoes and banana are called thit-thi3, and those fruits grown on vines such as passion fruits and grapes are known as wa1-lun2. Similarly, flowers on vines | နွယ် are called မန် | mun2. This word is less known than ပန်း. သည်ပုတ်ထဲက သည်ပဲ | Dthi2 poat hteare3 gah1 dthi2 peare3 - Beans from the same pot fermented alike. - People from the same background and upbringing have similar tendencies. သန်းခေါင်ထက် ညဉ့်မနက် | Tha1-goun2 htet nyi1 ma1 net - The night cannot be darker than mid-night hours. - There will be a new dawn after the darkest hours of mid-night. Having gone through the worst, one can only expect the situation to improve gradually. သွားဖန်များ ခရီးရောက် | Thwa3 pfun2 mya3, kha1-yi3 yout - Make frequent trips, to reach the destination. - With perseverance, the goal is reached. Each small step counts towards the destination in the long journey. သျှောင်နောက် ဆံထုံးပါ | Youn2 nout za1-dome3 pa2 - Coil-hair follows top-knot. - In the old days, Burmese men kept the hair long and tied into a knot on top called youn2, while the women coiled the hair in different style called za1-dome3. This saying describes the custom of young men and women to get married and the woman follows the man's house. အကြံကုန် ဂဠုန်ဆားချက် | A-kjan2 kone2 ga1-lone2 hsa3 chet - When ideas run out, Garuda cooks salt without meat. - Just like in the American cartoon where Coyote chases the "Road-runner" with fork and knife in hand, in this hilarious proverb, the mythical bird-like creature called ga1-lone2 (Garuda) has devised a number of schemes to catch the dragon unsuccessfully. As he runs out of ideas to have dragon for dinner, he only cooks salt | hsa3 in his pot without dragon meat in it. This proverb is used to poke fun at the desperation of the opponents. အချိန်တန်တော့ နွားပိန်ကန်လိမ့် | A-chain2 tan2 dau1, na1-bain2 kun2 lain1 - When get hit, even the skinny cow will kick. - Not to worry too much over things as when the time is right, things will work out by themselves. Even the skinny cow will learn to kick and defend itself when faced with danger. အစကောင်းမှ အနှောင်းသေချာ | A-sa1 koun3 hma1 a-hnoun3 thay2-cha2 - Make a good start to ensure a happy ending. - In each endeavor, a good start and management is needed to keep the activity going, and intended goal can be accomplished. အစားမတော် တစ်လုတ်၊ အသွားမတော် တစ်လှမ်း | A-sa3 ma1 tau2 ta1-loat, a-thwa3 ma1 tau2 ta1 hlun3 - A bite of wrong food can be toxic, just like a step in the wrong direction. - Judgement is needed even in the mundane activities. အနာမသိ ဆေးမရှိ | A-na2 ma1 thi1, hsay3 ma1 shi1 - Unknown symptom, no prescriptions. - Corrective actions cannot be made without knowing the root-cause. အပွေးမြင် အပင်သိ၊ အသွေးမြင် အသွင်သိ | A-pway3 myin2 a-pin2 thi1, a-thway3 myin2 a-thwin2 thi1 - You can tell the tree by its bark, and a man by his character - Just like the type of tree can be guessed by looking at its outer bark, the inner character of a man can be known by the အရည်အသွေး | quality of his outward behavior. အမိမဲ့သား ရေနည်းငါး | A-mi1-meare1 tha3, yay2 neare3 nga3 - Motherless child is like a fish in shallow water. - The life of an orphan is like a fish in the shallow water. It can also be used as a metaphor to show how one has gone through struggles in life without support and protection. အလကားရသည့်နွား သွားဖြဲကြည့် | A-la1-ga3 yah1 dthi1 nwa3, thwa3 pfyeare3 kji1 - Don't examine the teeth of the cow one gets as a gift. - It will be inappropriate to look for imperfections and complain about something that one does not pay for, just like examining the teeth of the cow one gets for free to estimate the age. It has the same meaning as the English proverbs: Don't look a gift horse in the mouth. အလာကောင်းသော်လည်း အခါနှောင်း | A-la2 koun3 dthau2 leare3, a-kha2 hnoun3 - Good effort was made to arrive at the gate, but it was a little too late. - This saying with three-syllable rhyme was thought to have been uttered by King Kyansittha (ကျန်စစ်သား | Kyan2 Sit Tha3) of Bagan. His former lover Thanbula (သမ္ဘူလ | Thun2 Bu2 La1) whom he met before he was a king one day arrived at his Palace gate with a son he did not know he had. By that time, the king had already appointed one of his grandsons Alaungsithu (အလောင်းစည်သူ | A-loun3 Si2 Thu2) as heir to the throne. The son Yazakumar (ရာဇကုမာရ် | Ya2 Za1 Ku2 Ma2) was given the title of the prince and he is well known today for Myazedi Pillar Script (မြစေတီ ကျောက်စာ | Mya1-Zay2-De2 Kjout Sa2), a tourist attraction. အလိုကြီးက အရနည်း | A-lo2 kji3 gah1 a-yah1 neare3 - Greedy person ends up having less. - What was gained by unjust means will eventually be lost. အသားတွင် ဝက်၊ အသီးတွင် သရက်၊ အရွက်တွင် လက်ဖက် | A-tha3 dwin2 wet, a-thi3 dwin2 tha1-yet, a-ywet dwin2 la1-pfet - In meat, pork is the best; in fruits, mangoes are the one; in leaves, pickled tea salad is chosen. - Burmese traditional favorites are described. အသားထဲက လောက်ထွက် | A-tha3 hteare3 gah1 lout htwet - Like maggots coming out of the wounded skin. - Disloyal and rebellious subjects to the king or the country are compared to maggots who live on the skin and fed on it. Those ingrates do nothing to contribute to the host, but make the wounded sore worse. အသားလိုလို့ အရိုးတောင်း | A-tha3 lo2 lo1 a-yo3 toun3 - Ask for the bone to get the meat. - Indirectly asking for something smaller or inferior to be given something else. When the guest asks, "Can I have some bones? ", the host will surely give him meat instead. အားမတန် မာန်လျှော့ | Ah3 ma1 tan2, mun2 shau1 - Not enough strength, pride let go. - When means to achieve the end is insufficient, it is time to let go of what one wants. ဥတုရာသီ တောကိုမှီ | U1-tu1 ya2-thi2 tau3 go2 hmi2 - Weather depends on forests. - Observations and conclusions by folks generations ago agree with modern scientific knowledge. In the balanced eco-system, temperate weather is dependent on trees and forests. Deforestations to built cities result in droughts. What's the effect of cutting down trees? Drought or flood? Looks like both are possible. Without trees blocking the sun, the land becomes dried out and many former forest lands quickly become deserts. In the rainy season in recent years, Myanmar has been experiencing the other effect — flooding. Without trees, the soil is free to wash away and cause erosion especially in hill areas. The obvious reason in Myanmar is logging to sell timber. The biggest driver of deforestation in the world is agriculture to make room for growing crops. The roots of crops cannot hold onto the soil like big trees. There is also a price to pay for constructions and clearing the land for human settlement. But we have to keep in mind that global weather system does not have artificial boundaries separating countries. Global warming has multiple factors and 'butterfly effect' is something that we don't fully understand; even small initial conditions may have chain reactions such as melting of ice in Hamalaya glaciers and flooding of rivers in Myanmar and Laos. အူမတောင့်မှ သီလစောင့် | U2-mah1 toun1 hma1 thi2-la1 soun1 - A strong intestine is a pre-requisite to precepts and morality. - A man must fill his stomach first before he can perform good deeds. အိုးက မပူ စလောင်းက ပူ | Oh3 gah1 ma pu2 sa1-loun3 gah1 pu2 - The lid is hot, pot is not. - The person experiencing the difficult situation remains calm while another person who has no business becomes restless. ဥစ္စာဟူသည် မျက်လှည့်မျိုး၊ ပညာဟူသည် မြတ်ရွှေအိုး | Oat-sa2 hu2 dthi2 myet-hleare1 myo3, pyin2-nya2 hu2 dthi2 myut shway2-o3 - Material things are perishable like magic; knowledge is valuable like a pot of gold. - Knowledge is golden while material world is like a magic show that can suddenly disappear. အိတ်ပေါက်နှင့် ဖားကောက် | Ate pout hnin1 pfa3 kout - To collect frogs using a bag with a hole. - This saying describes wasted effort, time, and money. အိပ်ချင်ယောင်ဆောင်သူ အနှိုးရခက် | Ate chin2 youn2 hsoun2 thu2, a-hno3 yah1 khet - To awaken a person pretending to be asleep is difficult. - Although pretending to act normal, a deceitful person is not at ease and looks unnatural. အိမ်နောက်ဖေး ဈေးဆိုင်တည် | Ain2-nout-pfay3 zay3-sine2 teare2 - To open a shop in the backyard. - This refers to growing vegetables in one's own backyard, so there will be no need for grocery shopping. အိမ်သာလို့ ဧည့်လာ | Ain2 'tha2' lo1 eare1 la2 - Guests and people come in droves, often visit home sweet home. - People enjoy visiting a peaceful house of friendly hosts. This saying is often used by the Burmese government newspapers to take credit for increasing numbers of tourist arrival to the country.